Looking into the future with Essilor Canada. For the seventh straight year, Essilor has been named by Forbes as one of 100 of the world’s “Most Innovative Companies” for 2017. Essilor says it invests heavily in research and development to create new products always better adapted to the needs of wearers. It markets its products in more than 100 countries and has 33 plants, 490 prescription laboratories and edging-mounting facilities as well as five research and development centres around the world. Recently, Optical Prism spoke with Essilor Canada, a subsidiary of Essilor International, about its efforts to create and market products to younger generations as well as products that protect the eyes from the potentially harmful effects of blue light. Q. Transitions recently unveiled a new campaign aimed at Millennials. How important is the Millennial generation to the future of Essilor Canada? A. We know that Canadians have visual needs that impact their lives, their ability to learn and perform. This is why at Essilor Canada, our mission of improving lives by improving sight is the driving force behind everything we do. The younger generations, Millennials (Gen-Y) and Centennials (Gen-Z), are the future of our industry. We estimate that they could represent a potential of nine million wearers1. Getting to know them better can provide eyecare professionals with a sustainable competitive advantage both as an employer and a vision care provider. It is therefore important to understand their needs and behaviours, which are totally different from their elders’, and develop new ways to attract and retain them since they will become the eyecare professionals and progressive lens wearers of tomorrow. Q. Can you tell us about your new Transitions campaign for children? A. There is a significant opportunity to correct and protect children’s vision. We know that 25 per cent of school-age children in Canada need vision correction and do not have it today,2 which represents two million children with uncorrected vision1. Good vision is essential for learning, development and performance in school because 80 per cent of a child’s learning before the age of 12 comes through his eyes2. And finally, children are the most sensitive population segment to harmful light from UV rays and blue light, with exposure three times higher than that of adults. Indeed, children’s eyes continue to develop until 10 years of age. They are more fragile than adults’ eyes, and their crystalline lens allows up to seven times more harmful rays to enter their eyes than that of adults3. It is, therefore, essential to protect children’s eyes all year long. 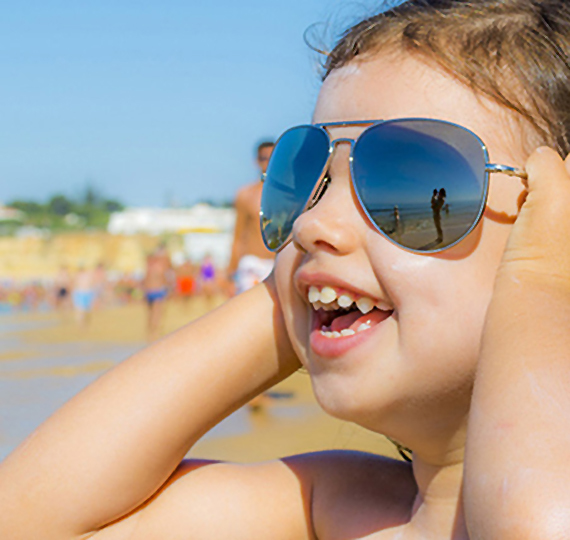 Transitions® lenses are an ideal choice for Gen Z because they help protect from UV rays, harmful blue light from digital devices and bright sun, all of which damage kids’ eyes even more than adults’. To help eyecare professionals better understand and treat young wearers, Transitions® Optical has released new resources featuring staff education marketing materials and practice resources. The kids’ resources can be viewed and downloaded by visiting Transitions.com/Kids. In addition to this campaign, because we feel a sense of responsibility towards the future of our country and of our industry, Essilor Canada has partnered for the past 10 years with local optometrists and opticians, non-governmental organizations, and associations to increase access to vision testing and eyeglasses for children in need. We believe that by working together we can make a difference in the community. Q. There has been a lot of talk about the dangers of blue light. Considering the use of laptops and cellphones are on the rise, how serious of an issue do you see this as being for Canadians in the future and how focused is your company on continuing design solutions? A. Blue light is often associated exclusively with electronic devices and screens, however, the sun is the largest source of blue light, emitting over 100 times the intensity of electronic devices and screens. Therefore it is important to protect one’s eyes from blue light both indoors and outdoors, all year long, and from a young age since its damaging effects are cumulative over a lifetime. 30 per cent of adults spend over nine hours a day using digital devices4. Seventy-two per cent of Canadian adults aged 18 to 39 years old (10 million people) use at least three electronic devices per day. In the long-term, the cumulative effects of UV rays and blue-violet light reaching the eyes’ front and back internal tissues are contributing factors to eye diseases6 such as cataracts and age-related macular degeneration (AMD). These are two leading causes of vision loss among adults over the age of 507 and with an aging population, the occurrence of cataracts and AMD will be multiplied by 2 in 30 years8. As the Canadian population is growing and our digital devices usage is increasing, so are the needs for visual correction and protection, as well as eye disease prevention. Several solutions offered by Essilor Canada are currently available to protect the eyes from harmful light, with coatings or lenses that selectively filter harmful blue-violet light and protect from damaging UV rays. With the Eye Protect System™, eyeglass wearers benefit from optimal protection against harmful blue-violet light and UV rays by combining Crizal® coatings with Varilux®, Eyezen™+ and Transitions® lenses. To fulfill our mission, we’re constantly looking at the market, trying to meet the needs of today and anticipate tomorrow’s. We continue to invest to adapt to the changing environment. Essilor spends over $265 million in R&D annually globally to bring innovative products to market that meet the needs of consumers and will continue to do that in the years to come to create differentiation, growth and value for our business partners. 1 Internal Essilor Canada estimation based on Statistics Canada census 2016 and internal surveys conducted by Ipsos and Mc Kinsey with Canadians in 2014 and 2015. 7 World Health Organization. Magnitude and causes of visual impairment. Fact sheet no. 282; 2004 [November]. Available: http://www.who.int/mediacentre/ factsheets/fs282/en/(accessed 2007 Sept 14). 8 Simplified Extrapolation AMD model. Essilor International, DMS, EL, Jan. 2013. United nation: World Population Prospects, epidemiological and marketing studies.